Maria Larkin is a standout in the local cyclocross scene, and while she discovered the sport in the United States, she’s originally from Ireland. 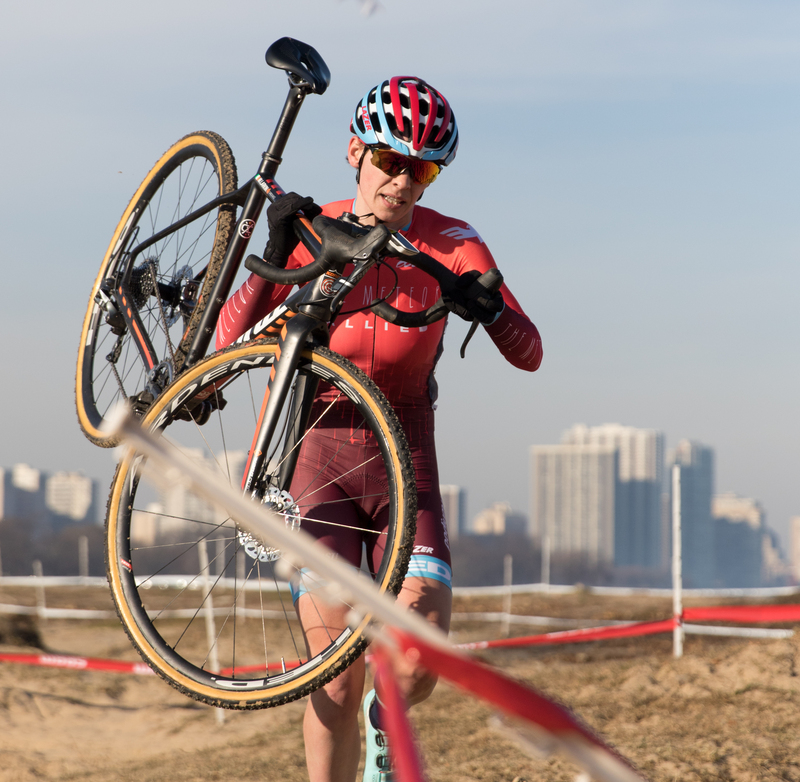 She’s a three-time medalist at the Irish National Cyclocross Championships, and can be seen at all the Chicago Cyclocross Cup races this season, while teaching a beginners clinic on the side. Chicago Athlete: You started racing cyclocross in 2010, but how did you get into it? Did you have a background in cycling? Maria Larkin: I’m from Ireland, and I moved to Humboldt Park in 2010, and I met a couple friends through the bike community because I started commuting to work. I rode a little in Ireland just to get around. My best friend Daphne was involved in the messenger scene, but wanted to get into more formal bike racing, and asked if I wanted to do it with her. We mostly started on the track and the road, and I did cyclocross a few years later once I got my bike, since everyone rode track bikes in 2010. CA: What are some of your greatest accomplishments in the sport since then? ML: This year, I went to the World Championships on the Irish National Team and it was a real privilege. I was the first Irish woman to compete in the elite championships. In order to get there, I had to do a lot of high-level racing and go through the selection process; I’ve been on the podium there three times. I’ve gone back every year since then, and in January I got fourth place, which just means the racing scene is getting a lot better and more women are racing. 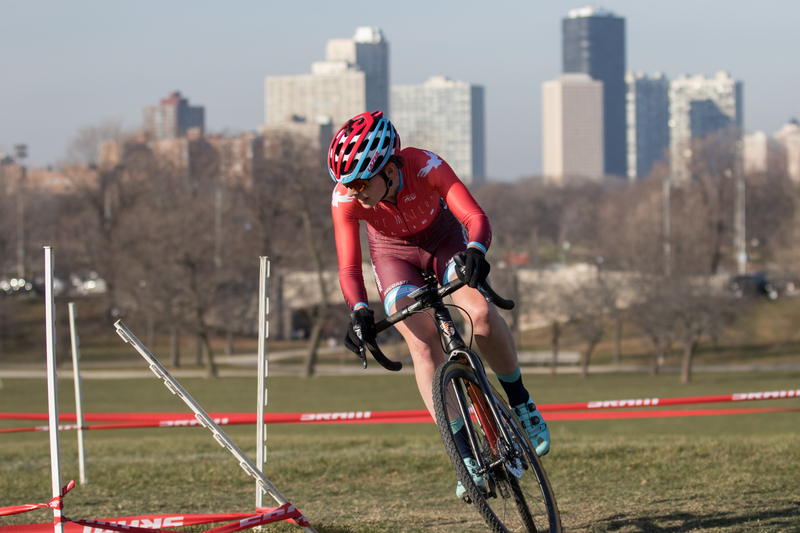 Here, I normally compete at the Chicago Cylocross Cup [CCC]; it was a great introduction to racing because it was structured and you can compete every week and improve. It’s a good entry-level field for women, which is new in the United States, and then you slowly move up and get into the elite field. I’ve slowly improved, and now I’m in Category 1 races. I also got selected to race at the World Cup in Waterloo Wisconsin for Ireland; the American national team is very competitive. CA: What are your goals for this season? ML: I’ve never won the Irish National Championship, and since I got the silver in 2014 I really want gold. It’s tough though because the style of racing here is way different than Ireland; it’s way wetter and muddier there, so much slower conditions. I need to race more in Europe in order to do that and I hope to do so in December. The U.S. races typically end in December, and during the month gap before Nationals, a lot of U.S. riders go to Europe to train. CA: What is Cyclocross like in other countries? ML: It’s actually the national sport of Belgium, and riders in the Netherlands are good too. It’s totally different in Europe though – an all day event; there’s gambling and beer tents, so it’s a huge party. Belgium’s Keerstperiod, which is their Christmas racing event, goes from December 25 to January 5, and there’s a race every single day. I think American cyclocross should do something like that because it’s a good winter sport; everyone is so cooped up in Chicago in the winter so it’s great if you can get outside to do something for a few hours. It’s also a great spectator sport because the courses are mostly in parks and are several loops. CA: What’s your favorite part about the sport? ML: The community, and I think a lot of people would say that, especially for women. Women aren’t as well represented in cycling sports as men, but I’ve seen a lot of new women in the sport recently. It’s also a very approachable sport, so finding friends and mentors is easy. If you want to meet some strong women and overall cool people, the racing community is the place to do that. The camaraderie is just great. It gives you something to look forward to every week. especially when winter is miserable. Fall is beautiful, with the changing colors and is just a good bike riding time. The sport gives you the bravery to ride through winter, and we need more people riding all year to make it safer. CA: What type of bike do you ride? Any other favorite gear you can’t go without? ML: Well, I have a bike for everything. My husband, who influenced me to start this in the beginning, works at Johnny Sprockets, so he has a lot of bikes, and luckily were the same height so I was able to borrow his bikes until I knew what I could do and wanted. I have two cyclocross bikes, a road bike, a commuter bike I ride to work every day, and one mountain bike that we share. We don’t have a car, but 12 bikes between us. The cyclocross bike I’m riding right now is a Kona; I actually have two of the exact same bike, because it’s a winter sport so generally the terrain is muddy. If something happens to your bike during the race, you can exchange it in the pit, so they have to be exactly the same so you can race. Podiumwear, a local company in Minnesota, supplies me with my kit, and I get skin suits and options for bike shorts called baggies, those are my favorite. CA: Do you have tips for someone who might be hesitant to try cyclocross? ML: There’s a lot of really good stuff happening in the CCC and a beginner should definitely come to the first event, as it’s generally very dry and easier. If you wait until conditions worsen, it’s much harder to learn. You can also come and just talk to the different teams, we all have tents set up and anyone can come talk to us. During the winter it’s really hard to train, but EDGE Athlete Lounge sponsors a road team, and they have a lot of recovery and training resources. They keep me positive when it’s miserable out and I need to keep going. CA: Anything else you want to add? ML: I run a clinic and host Wednesday morning cross practices, which is associated with Comrade Cycles Bike Shop in Humboldt Park. It’s six weeks long; we go over the basics in week one, and then explain how to race and different techniques to get on and off bike for barriers and obstacles and jump them. I’ve been doing that for a couple years. I also help out with Blackstone Bicycle Works, which is a closed cross practice for kids. We teach them how to work on bikes, and then offer the opportunity to earn a bike and race themselves to become integrated in the community. Cycling isn’t very diverse, so if we can get access and develop skills with racing and how to work on bikes, it will add diversity.